Amish Miniature Nine Patch in Nine Patchwork Quilt Wall Hanging. This is a classic Amish design, executed in Old Order Amish colors with the unexpected juxtapose of light and dark, all done in miniature, which is a complex twist to an old time favorite. Mary S. has pieced this wonderful Amish Wall Hanging on her tredle sewing machine. You can see a photo of this top as it is finished next to her machine. Mary Grace, our Mennonite quilter, was the quilter for this beautiful Amish Miniature Nine Patch in Nine Patchwork Quilt Wall Hanging. You can read about Mary S and Mary Grace in the Meet our Amish Quilters page. This wall hanging measures approximately 35 1/2 inches square, and has about 6 handquilted stitches per inch. 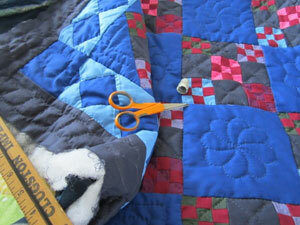 This Amish Quilt comes with a Level One Certification (click here for more info) stating the name of the quilter.